Reduced case image marked & with brightened insert: Blurred Moon - too bad to be a fake? Don't forget to sroll down this page completely for analysis! 1. I was in my garden taking photos of the moon. 3. I first thought it was a satellite or the ISS. 4. I didn't see any detail on it as I was far away and it happened really quickly, no more than 5 seconds. This thing moved quickly and in a diagonal direction from the left side of the moon in a straight line, then it disappeared. 6. I lost sight of it and was unable to locate it again. BEAMS comment: The only problem with the whole image is the Moon itself, it's out of focus, while the unidentified object seems to be in focus; well, it is possible that this is down to camera shake and that the 'worm' itself is also blurred or even doubled. If the witness Photoshopped this image, surely he would have used a better pic of the Moon?... it's just too 'bad' to be a fake in our opinion, and bears the hallmarks of an amateur photographer who simply panicked when he saw this object suddenly shoot away from the lunar surface, and perhaps accidentally jogged the camera/scope as he snapped it. Using the Moon as a reference point, this object must be gigantic in size - and we suspect that these aren't light reflections on the object, but rather, they are illuminations being generated BY the object itself! 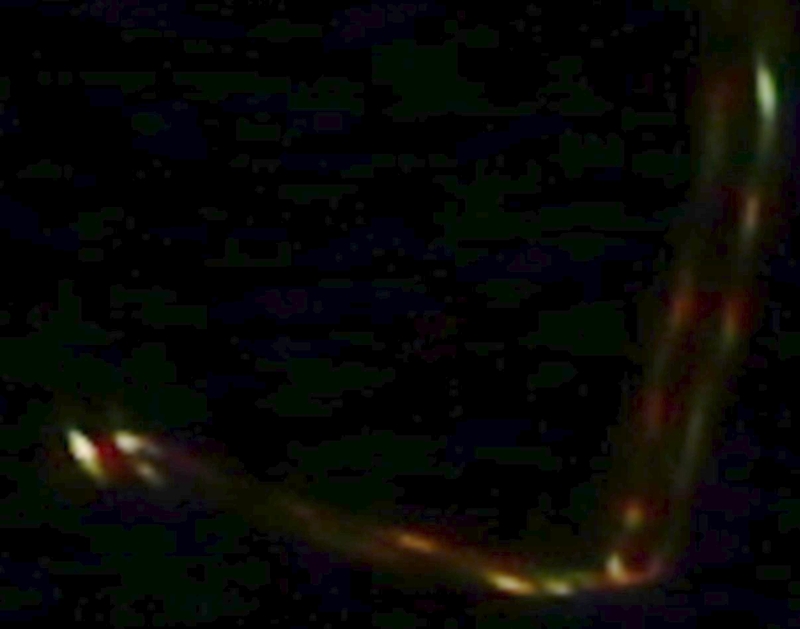 We have a couple of similar worm/snake-shape UFO cases on record like this, although usually photographed in our skies rather than in the vacuum of space, which makes this report even more unusual. A piece of space junk? Note the candy stripe twist colours on the object? what kind of spacecraft could this have come from? Cynics can scoff and deny it all they want, but regular BEAMS readers will know, as we do, that there's definitely something mighty unusual going on, both out there and all around us!